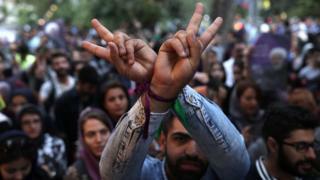 Iran's re-elected moderate President Hassan Rouhani has received a further boost after reformists won key council elections in the capital, Tehran. The pro-Rouhani reformist group Omid (Hope) won all 21 seats, ousting their conservative rivals who had been in power for 14 years. Mr Rouhani won Friday's presidential election in the first round. He promised voters a moderate and outward-looking Iran and criticised the conservative-dominated judiciary. Council elections were held alongside the presidential vote and the results were announced on Sunday. Will he be able to deliver? How is Iran ruled and what is the Guardian Council? The new city council must convene within 45 days when it will elect a new mayor to oversee services for Tehran's nine million residents. Incumbent Mayor Mohammad Baqer Qalibaf was a candidate in the early stages of the presidential election but dropped out to back hardliner Ebrahim Raisi. Mr Raisi only received 38.5% of the vote, which was not enough to take the election to a second round. President Rouhani, 68, said his resounding victory showed that voters rejected extremism and wanted more links with the outside world. Analysts say he is in a strong position to seek reforms and to revive Iran's ailing economy. After his re-election there were celebrations in the capital, Tehran, with crowds of young people singing and dancing in the central Vali Asr Square. In his first speech after the result was announced Mr Rouhani said: "The Iranian nation has chosen the path of interaction with the world, a path which is distant from extremism and violence." Mr Rouhani supports the landmark deal with world powers to curb Iran's nuclear programme. Iran election: Hassan Rouhani gets big mandate but will he deliver? Video After the presidential elections, will Iran still welcome trade with the West?